Kerala’s community model for palliative care has sustained attention in global palliative care discourse, as an alternative, resource-effective form of organizing. What distinguishes the community model from professional-centric models such as hospices and hospitals, is that the community volunteers serve as the anchor in coordinating ‘total-care’ – i.e., medical, social, financial support and rehabilitation – for patients and families. Since 2009, I have been tracing the genesis and trajectories of Kerala’s palliative care movement. What has been fascinating in this research journey is the question of voluntary bottom-up participation. Not only have some community organizations been providing care every day since 1995, these organisations have also diffused to different geographies in Kerala, birthing new practices as they do so, and involving new patient categories based on community specific needs. Moreover, this bottom-up community involvement has created a ‘pull-factor’ for elected representatives of local-self-governing institutions to support these initiatives. While each of these developments present interesting sociological questions, of central interest to practitioners and policy makers is the question of transfer and translation of the Kerala model to other contexts. Translation of the Kerala model presents structural challenges given the state’s unique history of mobilization, particularly for health. Kerala has consistently presented high social development indicators on health criteria such as life expectancy, infant mortality, and birth rates. Kerala also leads in public health infrastructure and is considered a vanguard state in health interventions. My recent article with Shahaduz Zaman and David Clark, “Translation of a community palliative care intervention: Experience from West Bengal, India” is one step towards understanding potential translations of Kerala’s community form. In March 2014, P.B. Salim – then District Magistrate of Nadia, West Bengal – sought a collaboration with Suresh Kumar, one of the pioneers of Kerala’s community palliative care movement. Kumar was affiliated with the Institute of Palliative Medicine, Kozhikode (Kerala) – a World Health Organization Collaborating Center and nodal institute in training, advocacy and research on palliative care. Salim identified a group of interested activists and local physicians to create a core group for community palliative provision in Nadia. The Institute of Palliative Medicine would provide the technical support. Under this collaboration between the District Magistrate, Institute of Palliative Medicine and the local chapter of the Indian Medical Association, Sanjeevani Palliative Care society was launched at Nadia in September 2014. I commenced field work at Nadia in June 2014, when the first set of volunteer trainings began. Observing this translation process was fascinating for me, since I had been tracking the Kerala palliative care movement’s genesis historically. Here was an opportunity to trace community mobilization as it unfolded! My involvement thereafter would include over 8 visits between June 2014 and November 2016. My collaboration with Shahaduz Zaman and David Clark commenced in September 2015, on common fertile ground. Although we came from different disciplinary backgrounds, theoretically, all three of us were keen on the question of “translation”. Translation conceptually allows for the transformation of ideas and practices by the receiving audience. Zaman and I jointly conducted two field visits – this was methodologically invigorating, as we debriefed at the end of each day, shared observations and connected insights from Nadia to Kerala. David has witnessed different stages of the evolution of the Kerala community model and was crucial in connecting our observations to global palliative care discourse. In Kerala, I had observed first-hand the participatory and bottom-up nature of organizing by non-medical professionals, such as farmers, school teachers, clerks. Thus, this top-down translation driven by a government official into a new context opened-up disquieting questions. Can community mobilizing occur through top-down interventions? Will the community take ownership for the initiative? During early awareness and training sessions, participants asked – would this be viable in West Bengal given the different structural context? Another participant suggested that West Bengal has a “political society” and “not a civil society”, elaborating that people readily affiliate with political parties but not member-driven organizations. These questions during the early phases heightened my interest. Translator’s role: In the West Bengal context, we found that the state official played a powerful role in enabling resource mobilization and in overcoming legitimacy issues. Nadia is a heavily resource-constrained environment, with high levels of economic destitution and weak health infrastructure. Several patients traveled a minimum of 150 kilometers to Kolkata to avail cancer treatment. Moreover, in addition to the legitimacy challenges that any new organisation confronts in a new context, palliative care was an unknown service, and the region had weak histories of community mobilising. In this milieu, material and legitimacy constraints could heavily impede mobilization. Here, Salim as a government official played an important symbolic role. His involvement lent legitimacy to the initiative, because of which there was significant attention among Nadia residents to undertake training and volunteer. Additionally, donors were forthcoming. 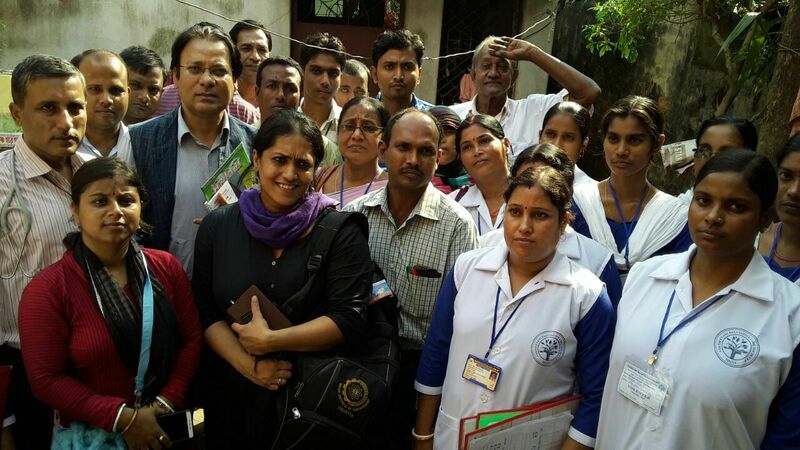 By the time Sanjeevani commenced operations, it had a team of 14 physicians, two nurses and thousand volunteers. As Suresh Kumar pointed out – a similar level of mobilization in Kerala could have taken years. The role of state officials in India in social welfare interventions is complicated. On the one hand, there is ample documentation of how state interventions, driven by vested interests among bureaucrats, have resulted in adverse consequences and destruction of existing ecosystems (see for instance, Sainath (1996). On the other hand, despite neoliberal reforms, the state remains a powerful entity for a large section of the population (Gupta, 2012). Our finding highlights the potential for considered alliances with state officials for community mobilisation. Occupational Status and Camaraderie. While healthcare translations typically emphasise the strategic, rational aspects of transfer models, we highlight the affective elements that surfaced during our study. In this non-remunerative context, volunteers cohered around occupational prestige and camaraderie of organising We were intrigued to find volunteer nurses adopt a uniform to wear during home care visits, and we unpack the implications of this practice in further detail in our paper. We highlight the affective commitments that bring people together to provide care in this materially constrained environment. Our paper engages with the transfer versus translation debate, presents key moments of translation as it unfolds, and points to issues with contemporary conceptualizations of ‘community’ in health interventions. Can a community form be translated top-down into a new context? A simple answer to this big question is yes; with some hand-holding, and while ensuring the creation of spaces for bottom-up participation. We posit that repeated visits from Institute of Palliative Medicine Members during the early phase, when aspects of community participation were reinforced, were pivotal in sustaining volunteer participation. Simultaneously, horizontal participation flourished where volunteers interfaced with patients and families – in identifying potential beneficiaries, developing relationships with families, and providing sustained care in destitute, arduous conditions. The study leaves two salient concerns. First, the Kerala model is today integrated with the public health system. Moreover, there has been a long history of morphine advocacy, easing up access to morphine for community organisations. In West Bengal, although state laws for morphine access have been amended, availability is still severely curtailed. In my understanding, Sanjeevani would need greater formal institutional support for long-term sustainability. Second, democratic processes are fragile and can be easily subverted. For community organizations to thrive, from the Kerala experience, we understand the need for horizontal associations, articulations for democratic processes, and egalitarian participation. While hierarchies seem innate to organizing in the Nadia context, community ownership may be sustained only through greater horizontal democratic participation. The Sanjeevani palliative care story is still unfolding and holds strong implications for our understanding of healthcare translations. I hope to return to Nadia, to examine the many questions that surfaced while we wrote our paper. Gupta, A. (2012).Red Tape: Bureaucracy, Structural violence, and Poverty in India. Durham: Duke University Press. Jeffrey, R. (2011).Politics, Women and Well-being: How Kerala Became ‘a model’. Springer. Kumar, S. (2013). Models of delivering palliative and end-of-life care in India.Current Opinion in Supportive and Palliative Care, 7(2), 216-222. Sainath, P. (1996).Everybody loves a good drought: stories from India’s poorest districts. New Delhi: Penguin Books India. Vijay, D., & Kulkarni, M. (2012). Frame changes in social movements: a case study.Public Management Review, 14(6), 747-770. Devi Vijay is an Associate Professor at the Indian Institute of Management Calcutta. Her current work examines inequality, vulnerable communities, and mobilisation, with a focus on healthcare. She has recently co-edited, Alternative Organisations in India: Undoing Boundaries (Cambridge University Press, 2017). She was awarded the Fulbright-Nehru Postdoctoral Research Fellowship (2016) and was a visiting fellow at the Mailman School of Public Health, Columbia University during the grant period.